My Life With Chester…………….. I started going to bird shows about 4 years ago, and I saw some Swainson’s toucans there. A guy told me if I wanted to talk to a toucan expert, I should get in touch with Jerry Jennings. When I went to Emerald Forest Bird Gardens, I was blown away by the varieties available. 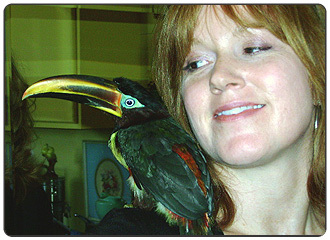 I was especially drawn to the Aracari and Toucanet because they are smaller, and I liked the look of them. I hesitated, because I was worried I couldn’t care for an exotic fruit eater….. I was afraid I couldn’t provide what he needed. A couple years later I ended up buying 2 parrotlets, because I thought it was more practical and “safe”. I loved them very much, but those beautiful soft bills kept haunting my imagination. I think I visited Jerry 2 more times before I finally decided. He showed me a Chestnut Earred Aracari that was totally tame and I knew this was the type of bird for me. I’m happy that I did so much research and waited, because I knew exactly what I was getting. Actually, I take that back…… I never knew how much fun I would have with this bird. He is the sweetest, cuddliest, most playful, and beautiful pet I have ever had. Every day when I go to greet him in the morning, I feel a big smile come across my face when I look at him. It’s so fun to see him develop and grow, his colors becoming more intense, his beak developing it’s amazing graphic design. He has his main walk-in aviary in my kitchen (and of course, the Parrotlets have their place in the kitchen, too)! And after breakfast, we all go into my art studio, the “girls” in the window sill playpen, and Chester in his “playpen” cage and perch. I don’t let them interact, because Chester could hurt or kill them. But I manage to keep them in the same room with no problems. This is a picture of Chester and me. He is about 6 months old here. We live in a loft in downtown LA, so if you think you needed a big outdoor aviary, think again. I make sure he has a stimulating environment with lots of toys and colors. We go out and see other people, and he visits with other birds at the bird club meetings! Sure, it takes time and dedication to care for him, but I think he has given me far more that I could ever give to him.